Whenever you are interested in growing medical marijuana, you will find that the more attentive you are to detail the more likely you are to succeed. Most people think that growing medical marijuana is simply a process where you get the seeds, put them in your garden and wait for them to grow. While this might work with some degree of success, the truth is that you often need to do a lot more to ensure that you get high quality marijuana and that it ends up growing fast enough. This is especially so when you are interested in using technologies such as hydroponics to grow the marijuana. The temperature of the environment in which the marijuana is growing will affect not only how fast it grows, but how healthy it will become. Ideally, the temperature should range between 72 and 76 degrees Fahrenheit when the lights are on. There are other factors that influence how hot the area should be, including whether or not you provide supplemental carbon dioxide to the plants. If you do, you might need to increase the temperature of the environment in which they are growing to around 84 degrees Fahrenheit. When adjusting the temperature, you need to take note of the way the plants react to this. If you notice some wilting or drooping a few hours or days after adjusting the temperature, it might mean that the new settings might not be ideal. In addition to the ambient temperature, you also need to make sure that the root zone temperature is optimal, usually between 67 and 68 degrees Fahrenheit. This is very important since it reduces thermal injury to the roots, which will then lead to the death of the plants. This is one of the most important environmental factors affecting the growth of plants. You might need to buy a cheap humidity sensor when you decide to grow your marijuana using hydroponics, so that you can keep an eye on the humidity levels in the area. Ideally, the humidity should be kept between 50 and 65% when the plants are in their vegetative phase. During the flowering phase, it should be maintained between 50 and 60%. 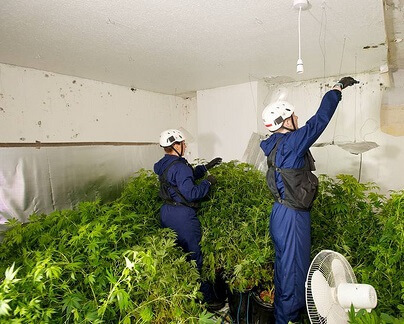 Having too much humidity will result in the growth of mildew which will not only reduce the quality of the marijuana but also stunt its growth. When the humidity is too low, the plants will lose a lot of water to the environment. They are likely to wilt more, and will strain the roots since they will be forced to absorb more water to cater for this loss. When using hydroponics, you will definitely need to invest in artificial lights to support the growth of the marijuana. However, not just any light will do. You need to ensure that the lighting is done in a technical manner so as to support the growth of the plants. During the vegetative growth phase (when the plants are young), the light should be on for 18 hours and off for 6 hours every day. During the flowering phase, you can change this to 12 hours on and 12 hours off. The best types of lights to use for them are LED lamps. These produce light of a pure wavelength, and also produce very little heat which might otherwise end up making the marijuana wilt. The LED lamps should ideally be 12 to 20 inches from the plants. There are some that are specifically made for growing marijuana, in that they produce a light of a wavelength that supports its growth. In order for the marijuana to grow, it’s often necessary for the atmospheric requirements to be met. Ideally, the plants need to get enough oxygen, particularly the roots which are metabolically active most of the time. It’s also important that they get enough oxygen since this is what is used to make food by the plant. The ideal CO2 requirements for marijuana is between 900 and 1600 ppm. Normal CO2 levels are usually lower than this, which means that you might need to invest in a CO2 emitter to increase the levels. You can also buy a sensor that will notify you when the quantities are within the range you want. As long as the technical issues above are sorted out, you should be in a position to grow medical marijuana using hydroponics with very high chances of success. Investing in all the tools needed for this type of growth might seem expensive, but in most cases it’s not. You will be able to find items such as the CO2 sensor for low prices online.